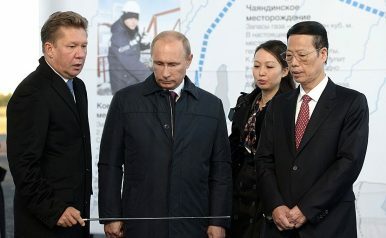 Russian President Vladimir Putin (center) with Chairman of Gazprom’s Management Committee Alexei Miller (left) and Vice Premier of China Zhang Gaoli before the ceremony to mark the joining of the first section of the Power of Siberia mainline gas pipeline. Can Russia Piggyback on China’s ‘String of Pearls’? Russia looks to gain an advantage from the glut of infrastructure projects in Pakistan, Iran, and India. Those lucky enough to visit St. Petersburg in the waning days of the Soviet Union often experienced the curious existence of old, imperial restaurants at the end of empire. Inevitably a waiter would approach with menus running page after page. When the time came to order, however, the waiter would merely ask “meat or fish?” and shatter the decadent illusion of choice. Russia’s strategic menu suffers from a similar duopolistic malaise. Energy and arms are the meat and fish on offer. There aren’t many other options worth much. For all that Russia has ostensibly done to spite the West and regain its seat at the table of great powers, China is the one with the strategic initiative in the Asia-Pacific. With or without any policy depth, Russia’s energy firms have pivoted to Asia because it’s where the action and demand are. While China can afford to throw money at various infrastructure initiatives, Russia can pick its spots in trying to strategically free-ride on growing energy demand to gain a toehold here and there. The China-Pakistan Economic Corridor (CPEC) and regional energy and political dynamics around it have proven to be an opportunity for Russia. With weak economic growth and poor reform prospects, Russia cannot rely on considerable cash reserves or a strong financial sector to buy influence across the Indian Ocean rim like Beijing. A proposed natural gas pipeline from Iran to India and Russia’s energy interests in Pakistan are therefore a test case for Russia’s ability to deploy its lesser means of influence – namely energy – to maximal effect. Iran is a window onto the Indian Ocean as much as part of Russia’s calculus in the Middle East. Iranian oil and gas reserves can give Russia a wedge in response to China’s rising influence and reach in Central and South Asia. Once upon a time, it was Russia helping negotiate the current nuclear deal with Iran end to economic sanctions. Now Russia faces energy sanctions as tensions escalate between the United States and Iran and the two countries mutually benefit from investment into Iran’s energy sector. Doing so is a prime opportunity for Russia to secure oil and gas abroad, deepen its often suspicious cooperation with Tehran, and provide new levers of influence for domestic elites in Moscow seeking to cash in on Russian foreign policy aims. Russian President Vladimir Putin’s visit to Tehran in early November yielded big news: as much as $30 billion in “strategic” energy deals between Russian and Iranian companies, though that $30 billion accounts for Iran-Rosneft deals alone, according to CEO Igor Sechin. A supply deal has also just taken effect such that Iran is sending about 100,000 barrels of oil per day to Russia in exchange for compensation split between euros and physical goods. More deals are undoubtedly to come as Rosneft, Gazprom, Lukoil, and smaller Russian oil firms jockey for influence and projects. Russian firms are similarly eyeing potential roles in the China-Pakistan Economic Corridor. CPEC is not so much a coherent physical corridor meant to connect the Pakistani port of Gwadar to Kashgar in Xinjiang, but a development plan with several notional stages of investment. As of May, roughly 64 percent of all proposed contracts – totals had reached $62 billion this year – involved power transmission or generation. Islamabad’s primary concern has been addressing a critical shortage of electricity, though that focus will shift in coming years. Officials claim that daily outages have been reduced from 10-12 hours a day as of 2013 to 3-4 hours a day as of this June, with an average shortfall of 2,888 megawatts. The focus on power generation is an opening for Russian firms to cash in on the flood of Chinese financing in Pakistan. They have had limited success, but interest is evident. For example, the proposed North-South pipeline, a 1,100 kilometer project designed to carry 12 billion cubic meters (bcm) of natural gas from LNG terminals in Karachi to Lahore, has yet to be decided. Estimated at $2 billion, the project is still up in the air over gas transportation tariff negotiations. Gazprom wanted to charge $1.20 per million British thermal units (mmbtu); Pakistan pushed them down to $0.85, and now wants $0.78. Russian Prime Minister Dmitry Medvedev pushed Gazprom to sign an LNG supply deal through an intergovernmental agreement between the two countries’ Ministries of Energy structured to operate on a three-year timeline and automatically renew, thus legally avoiding any tender issuance despite functionally being a long-term contract. Since Gazprom isn’t expanding its production, it’s going to have to rely on its trading arm in Singapore to meet demand. The positioning over taking lower toll rates as well as avoiding a publicly floated tender suggest that these deals are more politically than financially driven. Gunvor – a Cyprus-registered commodities trader – is in the running for the lowest bid on a current LNG tender. The delivery is meant for Port Qasim in Karachi. Port Qasim is primed for a capacity expansion, but ExxonMobil just pulled out of an LNG project there with Total and Mitsubishi. Other talks are in motion for parallel projects with other firms like Qatar Petroleum, Turkey’s Global Energy Infrastructure Limited, and Hoegh LNG of Norway. The news hampered hopes that Pakistan would get through this winter without any shortages, but Gunvor and Trafigura – a commodities trader with good relations with Russian firms like Rosneft – are pushing ahead with project proposals. Russia’s biggest regional energy success was the acquisition of Essar Oil’s Vadinar port and refinery in Gujarat, a guaranteed landing spot for large deliveries of Russian-owned crude. The Indian port and refinery could lay a foundation for a Russian “string of alexandrite” in the Indian Ocean if Russian firms can stake a role in the energy trade for each port: Vadinar in India, Gwadar and Karachi in Pakistan, and Chabahar in Iran. Best of all for Russia, it doesn’t have to spend its own resources to create any of these ports. Think of it as China’s “string of pearls” strategy to build and buy port infrastructure across the Indian Ocean rim into Europe in miniature, on the cheap, and without the same implicit military aspirations of dual-use infrastructure development. Each serves as an option to buy in and expand energy import and export capacity as the regional situation evolves. Some groups in India have supported a $7 billion undersea natural gas pipeline from Iran and Oman that would create a more competitive gas market and offer supplies an estimated $2 cheaper than LNG alternatives. The initial proposed route avoided maritime territory legally controlled by both the United Arab Emirates and Pakistan, making landfall in Gujarat. Most importantly, it would start in Chabahar. Chabahar has been touted by Japan and India as a cooperative venture meant to respond to China’s regional ambitions and an access point for India to trade with Afghanistan. India has just sent its first aid deliveries of wheat via Chabahar. However, any fallout from shifts in U.S. policy will negatively impact its partners’ ability to offer aid assistance to stabilize Afghanistan. Pipeline talks had not moved significantly from the initial proposal and tensions between Pakistan and India over the route remain. It seems that the Gazprom stepped forward to mediate and, most importantly, beat out LNG suppliers. Natural gas demand in India and Pakistan is rising on the whole. The Oxford Institute for Energy Studies’ projections for India’s demand last year estimated a rise from around 60 bcm now to nearly 100 bcm or else a much higher curve breaking 150 bcm by 2025. That comes out to an expected 50-60 bcm of LNG imported annually by 2025, assuming no pipeline project goes through. Pakistan’s demand has stagnated at a bit less than 40 bcm but newer CPEC investments into power plants will create more room to grow. Oxford’s projections as of last year weren’t able to take into account deals that have shifted since but potential demand was projected at almost reaching 70 bcm by 2025. LNG imports would rise from 4-6 bcm this year to 14-16 bcm by 2025 in that scenario. LNG is not Gazprom’s strong suit. As of mid-2017, Russia’s then lone LNG exporter contributed a lowly 4.2 percent of global export market share from its Sakhalin-II plant. But Gazprom effectively lifted Sakhalin-II from a consortium led by Shell and has never proven able to bring an LNG project to fruition on its own. Its proposed Baltic LNG plant is still in search of investors and could be onstream by 2022-2023. Yet even with some movement now, Gazprom lost its monopoly on LNG exports for a reason: the Kremlin wanted better performance and competition. Privately-owned Novatek is becoming Russia’s premier LNG player as its Yamal LNG project comes onstream and will likely provide a minimum of about 24.8 bcm of LNG capacity annually, with room for increases up to 82.8 bcm by 2035. Novatek relied most heavily on China’s CNPC and Chinese investments to weather sanctions, making China the primary recipient of future production. Novatek has approached Saudi Arabia as well as CNPC and the China Development Bank to finance another project near Yamal called Arctic LNG. Gazprom is losing out. Given Pakistan’s relatively small import needs and the huge potential for exports to one of India’s most important industrial regions in Gujarat, a pipeline project from Iran would allow it to hold a dominant role in Pakistan’s market and beat out competing LNG volumes to India. Talks of a pipeline running from Chabahar to Gujarat via Gwadar have not yet publicly identified where the natural gas in question would be sourced. Iran’s major gas fields lie on or offshore opposite Qatar and Saudi Arabia in the Persian Gulf. Indian firms have been interested in Farzad B, a gas field northeast of the giant North Pars field opposite Bushehr on the Iranian coast. India’s ONGC Videsh has offered Iran $5.8 billion to develop the field and another $5 billion to build an LNG plant. But ONGC Videsh has been unable to reach an agreement on prices with Iran. Iran has signed Memoranda of Understanding (MoU) with Gazprom on field development including Farzad B, a move to pressure ONGC Videsh. Rosneft has put in bids seen as more competitive for Farzad B to top it all off. By signing MoUs stipulating gas supplies be sent to India via Pakistan’s exclusive economic zone, Russia and Iran have put India into a corner. ONGC Videsh is pivoting elsewhere in Iran because it prefers to not invest into downstream activities, a stipulation from Iran for Farzad. Gazprom’s expected production reach, assuming its MoUs bear fruit, will extend south to the Kish gas field. None are close to Chabahar and India needs to secure natural gas as its own production can’t cover large demand increases. Fields closer to the port would logically feed any Iran-Pakistan-India pipeline but their fate is less clear. No matter the outcome of negotiations nearer Chabahar, Gazprom is best positioned to build up a pipeline network and project without significant cooperation with foreign firms exposed to sanctions risks in Iran and with Russian partners elsewhere. Farzad and other larger fields would likely source some of the gas exported towards India if Gazprom can negotiate for a large role building up midstream projects along the Persian Gulf. These developments suggest that China’s expansive investment ambitions in the Asia-Pacific are already creating strategic openings for other powers placed to exploit them. Energy investments in CPEC offered Russia an economic window to engage Pakistan. Having sought deeper economic ties with Iran, Russia’s energy companies were positioned to take advantage of the nuclear deal. By investing into oil and gas reserves in Iran, they in turn could offer Pakistan energy supplies as well as domestic investments while also leveraging India’s growing oil and gas demand. The Essar Oil purchase established a corporate beachhead in Gujarat to do just that. The question now is whether Gazprom – a partner that ONGC Videsh and other Indian energy firms would prefer over Rosneft given the acrimony around the Essar deal – can seize the moment. Floating a deal that runs through Pakistan entangles the three countries involved in the route and forces all three to contend with Gazprom. Russia has been careful to signal publicly that its relationship with India is “second to none,” no matter its overtures to Pakistan in the form of military exercises or other political maneuvers. China is stuck siding with Pakistan. Russia is not. It seems Moscow has a playbook to maximize its leverage despite its decidedly junior status with Beijing. Nicholas Trickett holds an M.A. in Eurasian studies through the European University at St. Petersburg with a focus on energy security and Russian foreign policy.